The comic book annual was often the biggest present you'd find in your stocking, only just fitting inside, although providing a sturdy spine for the other Christmas goodies. But how relevant are these annuals to the children of today - and how much might the Ruperts and Beanos of yesteryear be worth now? Duncan McAlpine, who runs the Comic Book Price Guide website, said annuals were a "uniquely British" tradition dating back as far as the 1820s, and a key part of a child's Christmas. He said some of the most sought after annuals were published during World War Two - these often ended with huge Christmas feasts that were appetite-whetting for hungry children unused to treats or luxuries. Books from this period are rare and hugely sought after. 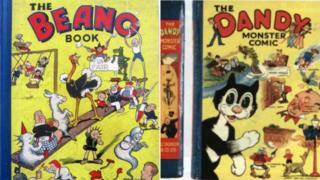 A 1940 Beano annual fetched £3,505 in October 2012, but a "very fine" copy could be worth double that amount, while a 1939 Dandy made £6,232 in September 2006, said the annual "devotee" and comic-collecting expert. Annuals about Rupert, the bear who wore a red jumper and yellow-checked trousers and scarf, are often sought by collectors. A copy from 1936, with its dust wrapper, could go for about £3,000, but if you are lucky enough to own one of the 12 copies of the 1973 annual - where Rupert has a brown face instead of the traditional white - you could sell it for more than £20,000, said Mr McAlpine. Annuals aimed at girls, like Bunty and Misty, are also being hunted down more than ever, according to the collector. "There's some really unexpected gems like the Misty annual with very sophisticated horror and suspense stories," he said. "Girls also kept their annuals in better condition." Maria Goddard, from Stella & Rose's Books, in Hereford, a specialist in rare and collectible books, said seeking out annuals was largely about nostalgia, particularly with Rupert books which "reflect an age of innocence". "Those who had annuals as a child remember them fondly as an adult," she said. "Thus begins the hunt for them and the desire to find and own all that were published." But what about the cotemporary market? One change from the early days of annuals, which were mostly dominated by comic book characters, saw diversification into areas such as sport, film, TV, pop music and computer games. Another addition was the annual aimed at adults. Adult comic Viz, which was founded in Newcastle in 1979, parodies the Beano and Dandy through the the antics of characters such as Johnny Fartpants, Roger Mellie and Billy the Fish. Since 1987 those behind the subversive publication have released an annual in time for Christmas, a collection of the best material from the previous 10 issues. Graham Dury, who is originally from Nottingham and has been a cartoonist with Viz for about 30 years, said the annuals, with their risqué titles, were largely about showcasing their best work. "The comic was largely rubbish in the first six years before they could justify putting any of it in an annual," he said. "Financially it's not as important as the comic, but it lets people know Viz is still going. The main money comes from the comic - it would be lovely if [readers] bought both. "The annuals have an enduring appeal and it's good value for money - it hasn't gone up in price for 15 years. "You often find them in charity shops or at car boots, but people do seem to collect them - they are nice things and always sell well." Even in a digital age in which there are many alternatives to the printed page, there is a still a market at Christmas for annuals for both adults and children. At the time of writing, The Beano is the number one bestseller in comics and graphic novels for young adults, on Amazon, followed by The Broons, Oor Wullie and The Dandy. In the broader category of children's books two annuals appear in the top 10 - Minecraft and Match, with The Beano at number 28. However, statistics compiled by consumer data experts Nielsen suggest that despite sales remaining strong, since 2009 there has been a year-on-year decline in the number of annuals being sold. In that year £18.7m was made through the sales of about 4.6m annuals, but by 2016, the revenue had more than halved to £7.8m with about 2.3m books sold. That equates to a 58% drop in revenue within seven years and a 45% drop in the number of annuals sold. The decline has of course coincided with the rise of the smartphone, the tablet and Kindle, although analysts say having a physical book is still attractive to consumers. Stephen Lotinga, chief executive of the Publishers Association, said annuals have been a "go-to present for British children" for decades, although he admitted that competition from digital products has had an impact on sales. So do annuals have a future? Les Hurst, from Derbyshire independent bookshop Scarthin Books, paints a gloomy picture. He said Christmas annuals were declining in appeal to young people and the only new one in much demand was Private Eye, which is for adult readers. Mr Hurst hopes that if parents and grandparents share their old annuals the tradition might be kept alive. However, Mr McAlpine is more upbeat. "I think annuals will [always] be around because of their tradition," he said. "It's a nice thing to receive and a very handy present if it's an annual concerned with your favourite TV show or football club, film franchise or pop star. "The diversity of subjects that can be covered is the annual's enduring strength and there will always be a place for a Beano book."